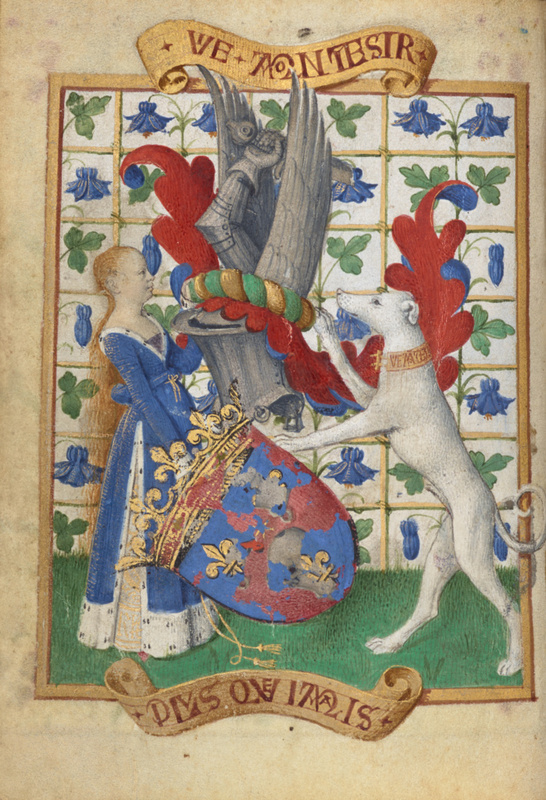 A woman and dog hold heraldic devices on the fourth miniature in the series of frontispiece illuminations painted by Jean Fouquet for Simon de Varie's book of hours. The figures support an escutcheon, or shield, which was repainted in the seventeenth century with fleur-de-lis but originally presented Varie's arms. This shield is crowned with the Varie helmet and crest. Scrolls at top and bottom display Varie's mottoes in elegant capitals. At the top and on the dog's collar, the phrase Vie à mon desir (Life according to one's desire) incorporates the second letter I within the V, and the D bites the E that follows it. This motto is an anagram of the patron's name, Simon de Varie. Plus que jamais (More than ever) unfurls on the bottom scroll. As with the manuscript's other heraldic images, this miniature celebrates Varie's new station in life, one that gave him access to the use of heraldry, restricted to the noble classes. Varie's high position at court gave him the financial means to commission this kind of book.